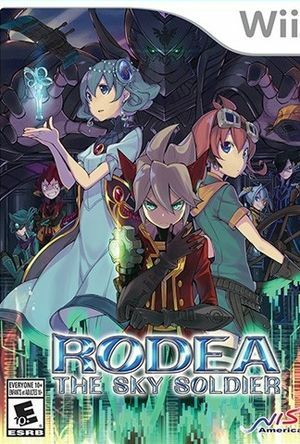 Rodea: The Sky Soldier, 1,000 years ago, Emperor Geardo of the Naga Empire sent an army of machine soldiers to invade the sky kingdom of Garuda. Thanks to the efforts of Princess Cecilia and Rodea, a machine soldier who promised to protect Garuda, Emperor Geardo’s assault was thwarted. In present day, a spirited inventor named Ion discovers an abandoned robot that has fallen into disrepair in the heart of a scorching desert. Upon completing her repairs, the robot stirs to life and reveals itself to be none other than Rodea. Stunned to find himself in the future, Rodea learns that the Naga Empire is no more and that Garuda has known peace for 1,000 years. But this peace was not meant to last, for the forces of Naga have returned to wage war against Garuda. Remembering the promise he made 1,000 years ago, Rodea takes to the skies to defend Garuda from the Naga Empire once again. The Wii language setting must match an acceptable language for the region of this title being played: Japanese for JP; English, Spanish or French for NA; English, French, German, Italian, Spanish, or Dutch for EU. Due to region checking built into the game, if an unacceptable language is set emulation hangs. The game occasionally desynchronizes the character voice acting and the dialogue text. When testing on a Wii U (via Virtual Wii), the character voice acting and dialogue text also desyncs occasionally. The graph below charts the compatibility with Rodea: The Sky Soldier since Dolphin's 2.0 release, listing revisions only where a compatibility change occurred. 4.0-8135 Windows 10 Intel Core i7 5930K @ 3.5GHz NVIDIA GeForce GTX 980 Runs mostly perfect, though I did experience the dialogue desync bug near the end of Chapter 1. 5.0-1483 Windows 7 Intel Core i5 6600K @ 3.5GHz NVIDIA GeForce GTX 960 Runs perfectly, did not experience the dialogue desync bug. The Direct3D 11 backend runs the best.